This post contains spoilers for the most recent episode of The Walking Dead. 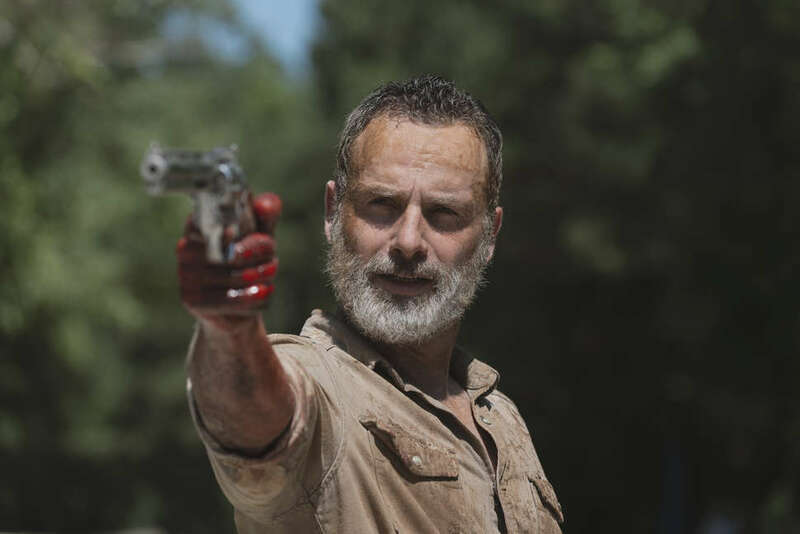 It's a moment fans have been waiting for -- or dreading: The Walking Dead said goodbye to Rick Grimes (Andrew Lincoln). Once news hit that Lincoln would be leaving earlier in the year, speculation ran rampant as to how he'd make his exit. In Sunday's episode, titled "What Comes After," viewers finally got the answer in an emotional return-to-form for AMC's flagship series that, in its ninth season, felt past its prime, in spite of Sunday night's news that there will be three new The Walking Dead movies coming to AMC in the near future. The story opens immediately where we left Rick last week: bucked from his horse, stuck between two enclosing zombie hordes, impaled on a pesky rebar at a crossroads. The literal and figurative symbolism couldn't be any clearer. After getting into a tussle with Daryl (Norman Reedus) regarding Maggie's (Lauren Cohan) mission to kill Negan (Jeffrey Dean Morgan) -- who's been held captive by Rick for the past year-and-a-half -- the duo split up as they were faced with a bigger threat: A ton of walkers slowly making their way toward camp. 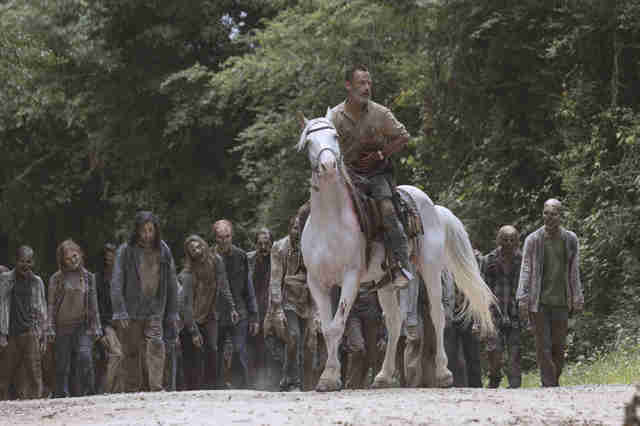 Rick's solution was to lead the walkers away on horseback. But that fix, as we saw play out in the episode, was incredibly flawed. As Rick bled out, he pressed on with the sole mission of protecting the community, inspired by the utopian vision his son Carl (Chandler Riggs) sent in a letter to his dad after his death. Comic book and show creator Robert Kirkman has said on more than one occasion that the term "the walking dead" could easily refer to the zombies plaguing this world, or the group of survivors pressing on as their own mortality bears down on them. As Rick ambled through the episode, fading in and out of consciousness, his pacing began to blend with the horde behind him. The ghosts and demons of his nine-season past were finally catching up to him. These ghosts came in the form of Shane (Jon Bernthal), Hershel (Scott Wilson) and Sasha (Sonequa Martin-Green), and each vision was more emotionally gutting than the one prior, each with a purpose. Shane pressed Rick to use his rage to keep him alert, Hershel gave Rick a heavenly vision of what's waiting on the other side of this hellish existence, and Sasha comforted Rick, amidst a sea of dead bodies filled with familiar faces, that he has successfully served his purpose -- that his mission was not a failure and his life was not lived in vain. Saying goodbye to Rick is one thing, but the return of Wilson to the role of Hershel packed an extra-special emotional punch, as Variety reports the actor died from cancer in October. That said, it felt as if the whole episode was one long eulogy writing itself in Rick's wake -- as he walked in his own footsteps through the hospital halls of the show's pilot episode, it was evident that his life was flashing before his eyes -- and ours. 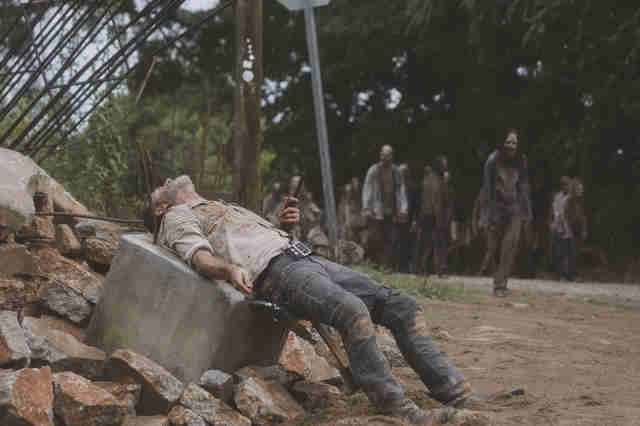 At the episode's climax, Rick found himself facing down the army of the undead on a shaky bridge that just wouldn't collapse. As Michonne (Danai Gurira), Daryl, Maggie, Carol (Melissa McBride), and the others looked on from a distance, Rick made the realization that the family he'd been looking to protect this entire time were the ones still living whom he had been keeping at a distance. That moment of clarity came in the form of a quick decision: Rick shoots a load of dynamite on the bridge, sending the carcasses of the undead, and presumably his own, into a fiery oblivion. This whole time, Rick and Michonne were worried about making Negan a martyr if they let Maggie kill him (sidenote: she didn't), but in the end, Rick was the one who cemented his legend among the crew. That notion wavers a bit, though, when you take into consideration the scene that came next: Jadis/Anne (Pollyanna McIntosh) rescues Rick, who somehow survived the explosion, and takes him for a ride on the mysterious helicopter we saw pop up throughout Seasons 7 and 8. We don't see Rick's true fate -- just a jump into the future where his tiny daughter is now shooting guns and rescuing people. The Hollywood Reporter confirmed on Sunday that Rick is indeed still alive: Andrew Lincoln will be back as Rick Grimes in three AMC-produced TWD feature films that will purportedly fill in the gap between the helicopter ride and that scene in the future, and beyond. Where does this leave us? With Rick gone and Maggie on her way out -- Lauren Cohan is only slated to appear in six episodes this season -- it seems that Daryl may be stepping up as the new leader, especially with the new "franchise/universe" deal that Norman Reedus (and Melissa McBride, who plays Carol) has inked with AMC. That change of the guard will make things quite interesting once The Whisperers show up. If the original comic has anything to tell us, it's that this group of villains who enjoy coats of human skin may actually make Negan's Saviors look like cuddly kittens. Look, we get it: Once Glenn (Steven Yeun) and Abraham (Michael Cudlitz) were murdered by Negan, the luster of the show began to wear thin. Adding Rick and Maggie to the list of fan favorites leaving may make it even more difficult to remain invested. But one thing's for certain: The Walking Dead continues to deliver the emotional stakes, against all odds. After nine years, nobody remains safe. ...But is The Walking Dead? It's a bit unclear if there still is an incentive for AMC to keep the show going. The viewership is declining, but with Scott Gimple's pre-season promotion from showrunner to chief content officer, tasked with overseeing the entire Walking Dead universe, it's clear the zombie series that changed television isn't going anywhere -- its world will actually be expanding. Instead of a program in its death throes, it's looking more like all of the drama leading up till now were the productive growing pains of a series in transition late in life.